Jose Mourinho’s men secured an important 3 points in this boxing day fixture against Swansea to pull into 2nd in the table until Manchester City played Liverpool in the later game on Thursday. As the result was confirmed, it was a 2-1 win Manchester City putting them 2nd in the table behind leaders Arsenal. Eden Hazard scored a delightful ball into the bottom corner in the 29th minute for the match winner. Even though our strikers’ dreadful presence in front of goal continued with Eto’o wasting handful opportunities, our incredible defense saw the match out and earned Jose’s Blues 3 points at Stamford Bridge. Chelsea FC (4-2-3-1): Cech; Ivanovic, David Luiz, Terry (c), Cole; Ramires, Mikel; Mata (Schurrle 71), Oscar (Lampard 66), Hazard (Willian 81); Eto’o. Swansea City (4-2-3-1): Tremmel; Rangel, Amat, Williams (c), Taylor; Britton, Canas (de Guzman 60); Pozuelo, Shelvey, Routledge (Bony 78); Vazquez. The Blues’ started the game with more possession against Michael Laudrop’s side who are used to controlling more possession against teams in many games. Mourinho’s tactic through out the game worked pretty well as the master tactician he is known as. Jose opted for a 4-2-3-1 by making 5 changes to the team that earned a draw against Arsenal on Monday’s vital showdown in the title race. And inside the opening 15 minutes, the Blues had wasted many close chances to would have seen them 1-0 or 2-0 up early and ‘kill the game’ as the Special One has been calling for many times this season. Chances came tick and fast but, it wasn’t until the 11th minute when Branslav Ivanovic’s shot was blocked by their captain Ashley Williams. Then, the 1st of 3 consecutive corners was earned. Juan Mata sent the crosses in with his familiar incredible fashion but, John Terry’s three well timed headers couldn’t steer into the back of the net. Even John Obi Mikel came close into finding the net following Our captain’s header which was cleared of the line before the Nigerian could pounce on it. Jose Mourinho’s men restricted the Swans from having much possession by closing them down and pressing high up which lead to high balls and many errors. And as was the particular case against Southampton at Stamford Bridge, the Welsh sides’ possession oriented, building from the back was destroyed by high pressing of Jose’s men. Aerial duels were finely dealt with by David Luiz and with the immense presence of John Terry in the back-line. 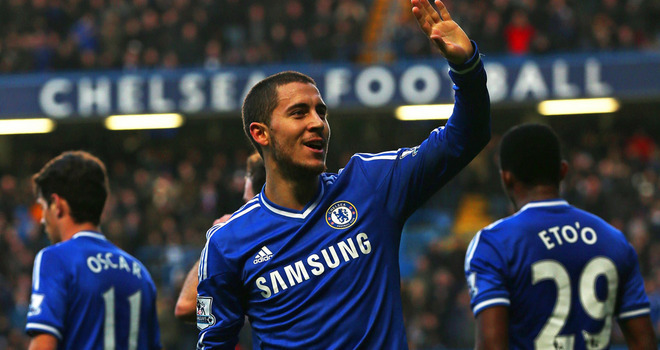 In the 29th minute, Eden Hazard received from Ashley Cole and scored a delightful goal from the edge of the box. He curled in past their right back and the keeper couldn’t save since his view was blocked by Williams. Samuel Eto’o then wasted an incredible chance right after the restart of the 2nd half. That miss echoed the Blues’ men issue this season which is reflected by the fact of 5 goals only between our three strikers this season. 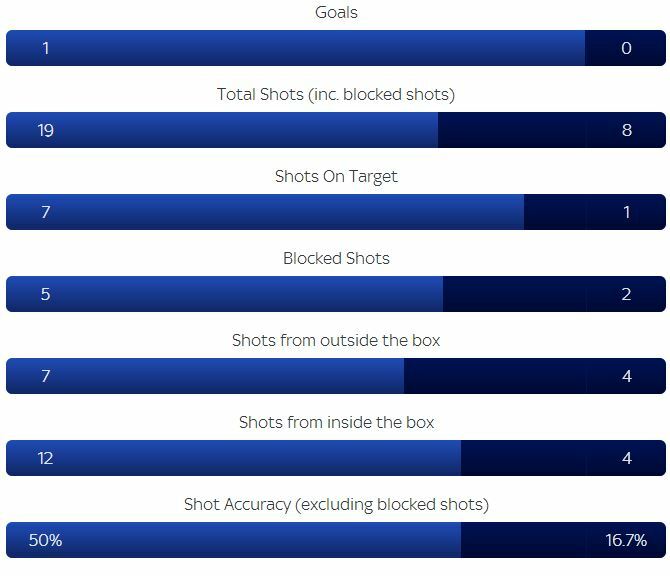 A feature of our recent games had been an inability to kill teams off when on top, so a decent spell of possession and territory for Swansea was of visible concern to Mourinho, anxious that his side not offer the opposition a route back into a game they had long been second best for. Trying to see the game off with 3 points, Jose Mourinho made three substitutions in the 2nd half first by bringing on Frank Lampard in the 66th minute for Oscar who just made his 50th premier league appearance for Chelsea. Then, it was Schurrle who came on 5 minutes later for Juan Mata who had a good game. Then, with an eye on Sunday’s game against Liverpool, Mourinho took off game winner, Eden Hazard by bringing in Willian in the 81st minute. There were some dangerous late moments, including a couple of vital injury-time blocks from Mikel, but we saw the game out for a second consecutive clean sheet and a crucial Boxing Day victory. Thanks for reading and hope you enjoyed the victory in this vital festive fixtures that now earns us 4 points and two clean sheets back to back ahead of the crunch game vs Liverpool this weekend. Follow me on twitter (@FahmiCFC) and KTBFFH!! !